The entrance to Weber Grill Restaurant seems more like an overgrown memorial to a lost barbecuing civilization à la Planet of the Apes than an homage to its founder. Before the front doors stands a life-sized statue of the iconic kettle grill's inventor, George Stephens, clad in a Hawaiian shirt and apron and standing in front of his grill, cooking up some burgers. It's done in rough black metal, as if to evoke the charcoal that fuels his empire. Stephens is dwarfed, however, by the two giant stone spires capped with flame-spewing cauldrons on both his left and right flank. The dramatic scene can't help but make you wonder if you're being lured to a volcano sacrifice rather than a backyard barbecue — or if, perhaps, the backyard belongs to a Goldman Sachs financier. The scene sums up the contradiction that is Weber Grill Restaurant. On the one hand, the small chain exists as a celebration of casual weekend cookouts, the kind of low-key evenings where you'd pull out your kettle grill and slow-cook some meat. It's ribs and burgers and beer-can chicken washed down with a Bud heavy while arguing with your jorts-clad neighbor about lawn darts. But while you can find that at Weber Grill Restaurant, it's buried beneath a thick veneer of fancification that makes the place seem less like a backyard barbecue and more like grill night at the country club. Open since April in the old BlackFinn American Grille space at the Galleria, the place looks like a sleek, modern steakhouse. Propane tanks, grills and black and white photographs sit in a floor-to-ceiling shadowbox by the host desk. Taupe, tufted banquettes and shiny blonde wood tables dot the room, and glass pendant lights provide soft lighting — as do several large grey fabric chandeliers with a grate detail at the bottom that artfully hints at the restaurant's inspiration. There's a separate bar area that continues the modern aesthetic, as well as the "Weber Grill Academy" room where would-be grill masters can watch dinner being prepared in an interactive dining space that's a cross between a teaching kitchen and a chef's table. If you don't want to go that far, you can simply peer into the restaurant's open kitchen and watch as cooks maneuver around massive kettle grills. 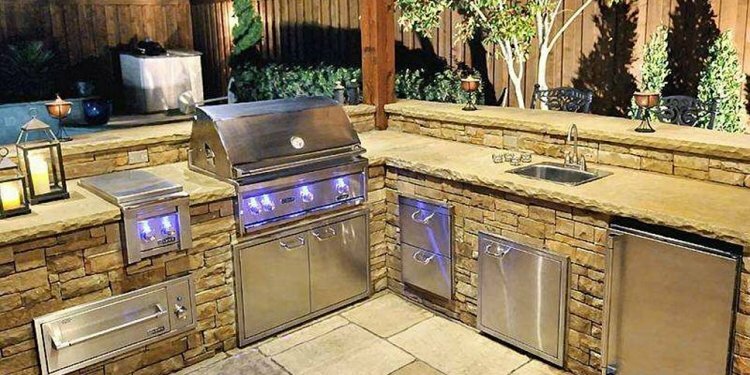 The whole place is unexpectedly chic, polished and upscale — not exactly the words that come to mind when you think of a grill. And the juxtaposition of casual and upscale can makes you scratch your head. I get the restaurant's dressed-up approach. The Weber Grill company's bread and butter is selling devices meant to improve the home cooking experience, rendering going out to eat less necessary. A dressed-up atmosphere and food is something you can't get at home — a reason to go out. Yet throughout my meal, I found that the straightforward items, the ones I could do just as well on the kettle grill in my backyard, were the restaurant's most successful dishes. Consider the honey Dijon chicken skewers, a testament to the beauty of simply marinated, expertly grilled chicken. The meat is sweet, kissed with char and shockingly succulent as properly done grilled chicken should be (but, sadly, rarely is). They are available as an appetizer, but I would have happily made an entire meal out of this fantastic dish. And who hasn't brought spinach artichoke dip to a backyard pot-luck? The restaurant offers an excellent version of the church cookbook dip — a bubbling crock of creamy molten cheese with just enough of the veggies to make you feel better about your decision-making. The fancied-up, more complex appetizers are less worthy, however. Tuscan bruschetta promised vine-ripe tomatoes, white bean pesto and smoked mozzarella. I assumed this meant a caprese served over crusty bread. Instead, it was nothing more than mediocre salsa. The crab cake was the bigger offender, though. I'll eat my column if this was made of exclusively jumbo lump meat, as the menu claimed. The entire thing was a pile of fishy-tasting mush that even the scant chipotle salsa couldn't cover up. Burgers, which should've been a no-brainer for a grill-themed restaurant, missed the mark because they overpromised and underdelivered. The restaurant's signature "Prime Burger" is a "secret blend" of prime beef and Weber seasonings, topped with bourbon-grilled onions and sharp cheddar cheese. I expected over-the-top good that I wouldn't get in my backyard; instead I received "meh" that made me long for well-executed simplicity. The "Farm Burger" was equally dry and underwhelming. The blend of lamb and beef had a pleasant taste, but it was served medium well (though it was ordered medium rare). Smoked bacon, oven-roasted tomatoes and goat cheese sounded decadent, but again, something just failed to pop — too little cheese? Not enough bacon? It's hard to unpack how something that sounds so right can end up so boring. The prime rib, too, fell far short, with smoke and an aggressively herbed rub overpowering what should be a delicate meaty flavor. I appreciated that rub on the signature "BBQ" ribs, though. The sweet and sticky glazed baby backs were so tender, you shouldn't pick up a bone expecting the meat to be attached. The sauce caramelizes on the tender meat, forming a sticky char crust that's especially excellent when mingled with fatty end pieces. A juicy, bone-in pork chop, glazed with the same honey mustard sauce that wowed on the chicken skewers, is comfortably familiar: The sweet mustard works with the pork which works with mashed sweet potatoes which works with sautéed spinach. This is a classic pairing you could find on 100 restaurant menus no matter what town you're in — but it's a classic for a reason, and Weber Grill Restaurant proves why. "Beer Can Chicken" is another example of how good a simple cookout dish can be. A half-chicken, stuffed with an open can of beer while it cooks, is nothing less than luscious. The beer keeps the meat moist, but the skin retains a smoky crispness. This place knows how to cook chicken. If the thought of paying $40 for a grilled sea bass at a chain restaurant in a mall fills you with shame, suspend your disbelief. Offered on the restaurant's "Founder's Menu" (read: expensive menu), this simple grilled fish may be the finest piece of seafood I've eaten all year. Sure, I could buy a great piece of seafood from a good fishmonger and cook it myself, but I am not capable of such grilling perfection. The meat, a char-kissed composite of butter simply dressed with tomato vinaigrette, is so outstanding it makes the price tag look like a steal. I'd say this is the best thing at Weber Grill Restaurant if I wasn't still raving to anyone who will listen about the kids menu. As someone who regularly dines out with a small child, I've pretty much given up expecting anything more than frozen chicken fingers and fries or a white bread grilled cheese. But the kids meal here is the Rolls Royce of child dining, covering everything from ribs to steak skewers to the best hot dog I've eaten since those bastards at Sara Lee discontinued Best's Kosher Beefs. And it's not just the main course that shines for kids here — the meal comes on a cafeteria-style platter with tater tots, fresh fruit, steamed vegetables, a drink and a homemade cookie the size of your toddler's face. Will they let adults order this meal of champions? One can only hope.